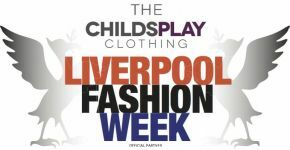 Tonight Purple Revolver attended The Childsplay Clothing Liverpool Fashion Week's New Talent catwalk show, which was a spectacular showcase of young contenders and their most daring creations. Charlotte White, 17, from The Wirral is one to watch with her unique designs that had hot fiery colours of orange, yellow and pink. Also, a staple of White's line was the race course pattern, which brought to mind images of the late 60s/early 70s cartoon Wacky Races. You could even imagine Penelope Pitstop as one of the models in pink. Another hallmark was the 90s-like pink pant suit that was a personal favourite. Clueless's Cher Horowitz could have had it in her digital wardrobe assembler alongside the black blazer made of light material embedded with the racetrack-like black and white squares. Fashion Feed's Helen Bratstone and Hollie presented their individual small, but stunning collections. Dark coloured lips smothered in glitter was a feature of Helen's whilst ice lollies took centre stage on Hollie's garments. Dark purples combined with whites and colourful fluttering material shaped as butterflies made Helen's dresses and soft blazers stand out amongst the different textures on the runway. Hollie opted for a red colour pallet with large hoop skirts that started from under the bust. One showcase that stole the show with their soundtrack was Enigma. For the bigger booties, this display showed that big is beautiful. The models strutted their stuff along to tracks such as "All About That Base", "Talk Dirty" and "Earthquake". The crowds were whooping, cheering and applauding the models who wore plaid, tartan and faux leather in all kinds of shapes. Blue and black were the favoured colours of Enigma. Last year's Liverpool New Talent winner Hannah Hodge opened the show with a sensational collection. Mixed textures and shapes were used to create a defining selection of clothes. Bodycons and party dresses were the first on the runway to provide inspiration for the upcoming party season that is no doubt set to run the streets of Liverpool. Splashes of colour were set upon black and white bases to create eye catching pieces. Oversized fur coats in black and white were prominently featured, ready for the winter blues. More dresses closed Hodge's preview which were of a different shape to the first set of bodycons. These A-Line skirted dresses and crop top/skirt combos had the colours of plum, black and white. Diamonds are a girls best friend as seen in the Diamonds Are Forever slot of the runway. Extremely bright colours mixed with 60s shapes and ditzy floral patterns would have gone down a storm at Pacha's Flower Power parties in Ibiza. Two-pieces and halter necks were prominent in designer Erica Wildflower's clothes in a variety of colours: lime green, hot pink, sunny yellow. A dedication to Ms Monroe was made through song choice and delicate contributions such as white, fur, diamonds, tiaras and feather boas. The Hollywood darling is an inspiration to the entire online boutique. Tiaz Boutique - created by Miss Tia - is one for the glitz and the glam. The party was full and centre with sequins, studded leather and leopard print. Bodycons and maxis were the staple lengths of dresses; barely any length in between. One of the most striking pieces was the backless long sleeved floor length dress made with navy material and a shimmer of gold thread all over. In contrast, the dark green bodycon was also memorable with its subtle glitter amongst the material and sheer flows arms. That was the entire night in a nutshell, not forgetting Amanda Moss's campaign "Familes Come First" which aims to ban the fine that parents receive when taking children out of school. Belissimo were (and should be) congratulated for their hard work on maintaining the models' makeup and hair intact. Purple Revolver was given a final piece of advice by one of the proud model's mums and girls everywhere take note: put hairspray, jam, or coke on the bottom of your heels to stop them slipping when you're strutting your stuff!